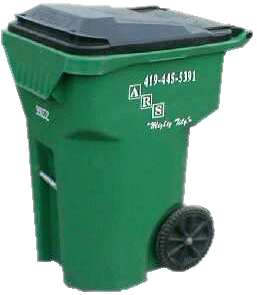 Residential Refuse Service | ARS REFUSE SERVICE, INC.
A.R.S. 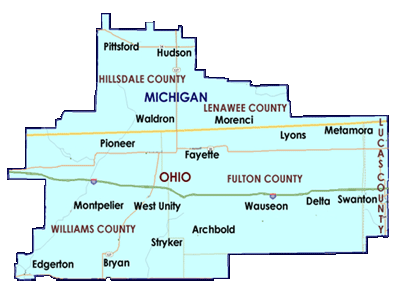 provides rural solid waste collection services in Fulton, Henry, Hillsdale, Lenawee, Lucas, and Williams counties. Our services are designed to fit all of our customers needs. Whether the need is for one bag a month to a pickup truck load a week, we have the right service at the right price. We have several different trash pickup services to fit your needs. Each bag service can come with an option 96 gallon or 60 gallon “Mighty Tidy™” roll out, maintenance free trash container on wheels. If you don’t have at least 2 bags per week, you can utilize our tag service. With this service you simply purchase tags from us and then you place a tag each bag that is needed for pick up. This is the best service if you don’t set out trash every week, or only set out 1 bag per week. Please call 419.445.5391 for current prices on our tag service. With this service, you able to set out (2) 30 gallon bags or cans each week for pickup. This service is also eligible for a 60 gallon “Mighty Tidy™” roll out cart. Please call 419.445.5391 for current prices on our 2 bag trash service. With the 4 bag service, you able to set out (4) 30 gallon bags or cans each week for pickup. This service is also eligible for a 96 gallon “Mighty Tidy™” roll out cart. Please call 419.445.5391 for current prices on our 4 bag trash service. With the 6 bag service, you able to set out (6) 30 gallon bags or cans each week for pickup. This service is also eligible for a 96 gallon “Mighty Tidy™” roll out cart. Please call 419.445.5391 for current prices on our 6 bag trash service. Along with our “Mighty Tidy™” cart pictured below on the left, we also offer larger containers for rent. Click the photos below for more information or call our office at 419.445.5391.